Have you ever had these concerns? We have a solution! Introducing our new Figure Bite! Many of our clients are looking for a way to make the hip straps on their figure suits sit high on the hips to accentuate their physique and hard work! 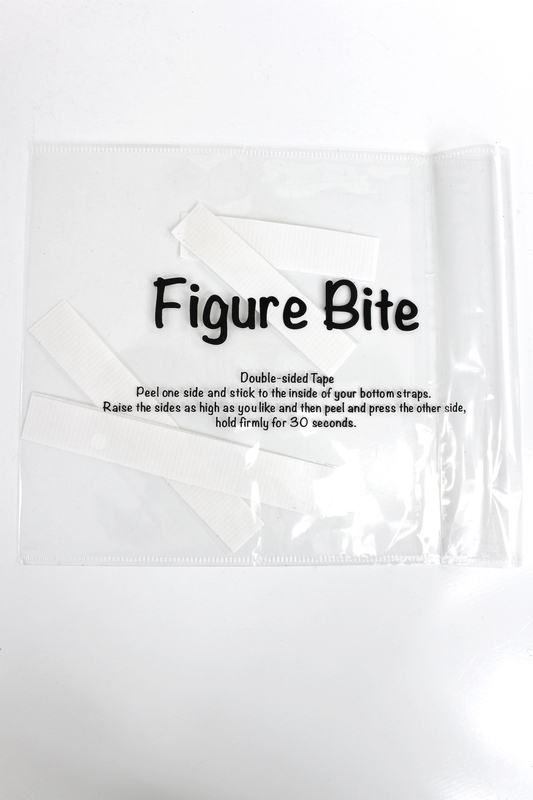 Figure Bite comes with a pack of high-quality double-sided tape. Figure Bite has a mesh-like composition for durability and a strong adhesive to avoid any slippage. Peel one side of the tape and attach the sticky side to the inside of your hip strap. Make sure not to stretch the fabric too much when sticking the tape on, as this can cause the hip strap to bunch. Once the adhesive is securely attached to the hip strap, peel off the other side of the tape and attach it to your skin, however high you would like the strap to sit. Ta-da! Secure and ready to pose! Figure Bite is available for purchase on our website now for only $6 + Free shipping! You’ve spent countless hours at the gym and rigorously stuck to a diet regimen all for this one moment on stage! Your physique is at the very best it can be, your diet has been impeccable and now it’s time to take first place just as you deserve! The Most Popular Bikini Designs are Bright Ombre Colors featuring different shades of Swarovski Rhinestones! Choose your bikini suit color that stands out the most for your skin tone, stay with eye-catching, bold colors! They are finally here! Waterproof Rhinestone Connectors! We have been receiving a lot of request for bikini suits compatible for water! And We are happy to announce that now we can create a bikini with rhinestone connectors that would not lose their original color! This is still a testing project and we would love to hear your feedback as well! The New Black Plating connectors are perfect for the beach! You can inquire about this style waterproof connectors for any of our Custom Made Designs at www.fitnessprodirect.com! Today, we will present our new design, made of ombre stretch spandex- very Classy and Unique, a look that impress! Beautiful combination and colors, just breathtaking! You can find it only at www.fitnessprodirect.com! We currently carry only four styles, but we will add all favorites to our collection. They can be customized with any free style tie sides bikini such us black bikini or any print spandex that you choose! The New Black Plating Waterproof Connectors can be used for Bikini Competition Suits, Figure Competition Suit, Posing Suits & Swimsuits! For any inquiries for Custom Made Bikini or Swimsuits, feel free to email us at info@fitnessprodirect.com! We will be happy to help! And lastly, don’t forget about our 4th of July Sale! Sale 20% on all our custom suits, enter Fourth20 ! When it comes to choosing your competition suit bottoms, the MOST important thing to do first is to check the rules and regulations of your show. Each of our back coverage options meet the regulations of at least 50% back coverage. Our bikinis are made by regulations for all organizations, such as NPC, IFBB, FAME, Bikini Universe etc. Once you have secured the rules and regulations to of the correct back width, you will want to choose the back width option that accentuates your body the way you want it to be presented on stage! There are so many different things to think about when it comes to creating your perfect suit for competition. After looking at countless competition suits in magazines or online posts, it is best to keep in mind that a suit design that may have worked so well for some, may in fact not be quite right for your own body type. Remember to keep an open mind and remember that each body is unique in its own way. One of the most important design elements of your suit is your top style. This style is recommended for women of all breast sizes, but works best for smaller breasted women. We recommend getting a size up in the triangle top, that way there is extra room for additional padding if needed. Our tops are fully lined, with a built-in inside bra pocket. We provide free soft or molded bra pad, depending on size. You can remove the bra pad or add more if needed. This style is recommended for bustier women as the thick straps push the breast upwards and provides the most support. This style is recommended for a smaller chest, as it is most like the design of a bra created to push breasts together. With that being said, it is hardest to perfectly fit a bra to the desired size and can sometimes look bulky or too tight around the bust. This style is recommended for both large and small breast sizes. It is a unique style to the usual choices of top styles, and could definitely wow the judges with its diversity. This style is another unique option, and usually for smaller breasts. If you are looking to try something different or stand out on stage, this is a great option to break out of the competition norm! Still confused? Don’t worry—Saleyla’s helpful and knowledgeable staff can help you find the right cut to perfectly fit your body! Judges have the job of inspecting and analyzing a lineup of nearly flawless bodies, which often leads them to rely on the minor details to make the final decision. While these six helpful tips might seem so miniscule, they really enhance the total package that you are presenting. Trust us when we say, it is worth the extra effort to perfect what seems to be the small details. 1. Nail your Posing Routine! Learn how to pose for your body and remember—practice makes perfect! It’s most important to think about what poses hide your weaknesses but showcase your strengths. Remember, your posing is how you are presenting yourself to the judges! Have no idea where to start? HINT: Meet with a posing coach! Your coach can be the first to tell you the perfect pose to fit your body type. Top Style: The most important thing to remember for picking the right top style is the size of your breasts. Are you bustier? Then we recommend the halter style. Are you a bit smaller in the top region? We recommend getting a size up in the triangle top, that way there is extra room for additional padding if needed. Rhinestone Connectors: From loops & circles to hanging or chain connectors—the possibilities are endless! Connectors are a fun way to add a little pizazz to your already beautiful suit. Stonework: Want to enhance your suit with some added bling? You came to the right place! We can completely customize your suit with a few stones or a rhinestoned covered suit! Stonework is yet another way to express yourself to the judges and stand out among the other competitors on stage! Still overwhelmed by the thought of picking the right suit for you? Don’t worry—Saleyla’s knowledgeable staff can help you find the right cut, color and connectors for your suit to fit your body! IMPORTANT: Test multiple tanning companies and their products before using them on competition day! A dark competition spray tan is applied to highlight muscle definition. Choosing the right product or tanning company can make the difference between a discolored, streaky mess to a smooth, even color! Although longer hair typically presents better, it is all about your facial structure and what looks better on you. The color and condition of your hair is not something the judges will miss either —and remember, those stage lights magnify just about everything. Try out a few different hairstyles and make sure to take pictures! If there is still room in your overall competition budget, we recommend spending the extra money on a Brazilian Blowout. This often calms frizzy, dry or overly curly hair with smoothness and an unforgettable shine! Stage makeup is much different than the everyday or even “girl’s night out” makeup routine that you already have nailed! If you applying the makeup yourself, don’t forget to match your foundation to your spray tan, which is likely 4-5 shades darker than your natural skin tone. Don’t match your eye shadow color to your suit, instead choose a color that enhances your facial features. Most importantly, remember to go heavier than you normally would because stage lighting can sometimes dim the appearance of makeup. If you happen to have the budget for it, hire a competition makeup professional. Take notes about what makeup brands and colors they use for the next time you want to recreate your winning look! Sometimes half the fun in competing is the glitz & glamour of it all! Wearing rhinestone jewelry or rhinestone studded shoes should be the final touches to the already perfect package you have created. With that being said, stage jewelry should add to your overall look, but never take away by drowning your hard work. Add a few small touches to your overall look, and voila! Your ready to step out on stage with confidence and pride! Welcome to our blog— we are so excited you stopped by to check us out! After being in business for over 9 years, we felt like it was time that we start sharing more about our company with our returning & new customers. For those of you who have yet to meet us at Saleyla, we want to say WELCOME. We recently became the owners of www.fitnessprodirect.com and this blog www.figureandbikinicompetition.com and will be happy to share some tips with our amazing customers! Our mission is to create the coolest most unique Figure & Bikini Competition Suits. We research trends, we sketch ideas, we select colors and fabrics, but most importantly we do everything it takes to create custom designs that fit and become you! Each suit we create is a unique work of art, beautifully crafted to enhance the physique that you have trained so hard for! When you visit us, you are going to see more than just competition suits. The Saleyla team knows that the journey to your competition is tough and we want to be there for you every step of the way! You are going to see the passion and detail behind the company as we share with you the tips & tricks behind creating a perfect competition suit for you! We will also feature articles about upcoming competitions, trends in makeup, hair & tanning for competitions, and of course the upcoming competition suit trends that you won’t want to miss! 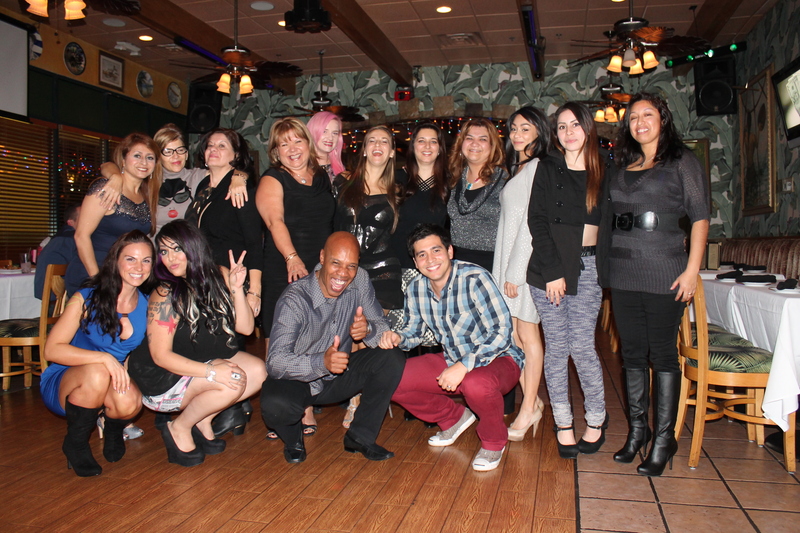 Last but not least, our clients are our biggest priority! Is there something we are missing here on the blog? Is there a certain topic that you are begging us to touch on? Your feedback is not only appreciated but encouraged! Leave a comment, shoot us an email, or give us a call! We would be happy to help!